Generating social media video views is hard. Getting people to interact with and share your videos on social media is even harder. Today brands and marketers are competing with the BuzzFeeds, Business Insiders, 9Gags, and Viral Threads of the world - all with big budgets, professional videographers, and talented editors. As social media and digital marketing strategist at Buffer, I had the opportunity to help generate more than 2,000,000 video views on social media in one year. Here’s how we did it and everything I learned in the process. There’s a good (and scientific) reason that animal, DIY, fashion, beauty, news and political videos fill our social media feeds. They make us feel something, which in turn, compels us to share the content with our friends and family. Perhaps the most important takeaway is that people share because they believe that the content reflects their identity (whether it’s true or not). Keep emotions in mind as we explore the ever-changing world of video marketing below. Truly successful brands in 2019 are creating videos with the mobile-first consumer in mind. Believe it or not, more than 95% of Facebook and Instagram users access the networks from their mobile device only. Simple improvements to your videos such as focusing on square and vertical format as well as capturing your audience’s attention in the first 3-10 seconds will instantly improve your results. In a recent study with Animoto, we found that vertical video on social media both increased engagement and reduced advertising costs when compared to its square counterpart. Before we got serious about video marketing at Buffer, we would post videos to social media ad-hoc, with no real strategy or understanding of what works. Video is one of the most compelling ways to reach your audience because video is the preferred way people consume information in 2019 and will be for the foreseeable future. Above all, we realized that in order to be successful with social media video, we had to experiment and iterate - a lot. It’s nearly impossible to determine which topics and videos will perform better than others with 100% accuracy (even 50% accuracy). Many times, we thought the topics that would perform well, tanked, and the topics we thought would perform so-so, ended up being some of our best. Since we couldn’t predict video success with 100% accuracy, we created a formula for producing quality videos, without overthinking it. Remember, – video is not a whole new type of marketing - video is a way to amplify your existing marketing strategy. In order to get a few quick wins, we turned to the content we knew was already performing well. For us at Buffer, that was our social media blog. We started by sorting our most visited blog posts from the previous 90 days in Google Analytics. Then, we created an Excel spreadsheet to add our favorite topic ideas to the list based on our most popular posts. From there, we dwindled down the list to topics that would “make sense” in video format and got to creating (more on our favorite tools later). The wonderful thing about social media video is that if you do it right, the videos can produce results for your business long after they’ve been posted. In looking at the many different paths we could take, we decided to focus on video topics that would (hopefully) be evergreen - as opposed to short-lived topics such as news. Focusing on perpetual and important allowed us to embed these videos in our blog posts, send them in emails to customers, and even embed them on our website because we knew they wouldn’t “go out of style” anytime soon. Plus, you can’t plan on a social media video going viral. It just happens. But that doesn’t mean we didn’t try! In addition to creating evergreen videos for our various digital assets, we did try to produce something we thought might go viral every once in a while. Meaning our social media video strategy consisted of perpetual and important topics 80% of the time, and swing-for-the-fences type video topics 20% of the time. Who knew that our audience loved kinetics so much! Note: Curated content is a great way to supplement your current video strategy. As I alluded to earlier, social media is supposed to be social. As much as much as we’d love for audiences to want to hear about our product or our latest free ebook or our sales pitch as businesses, the fact is they don’t. 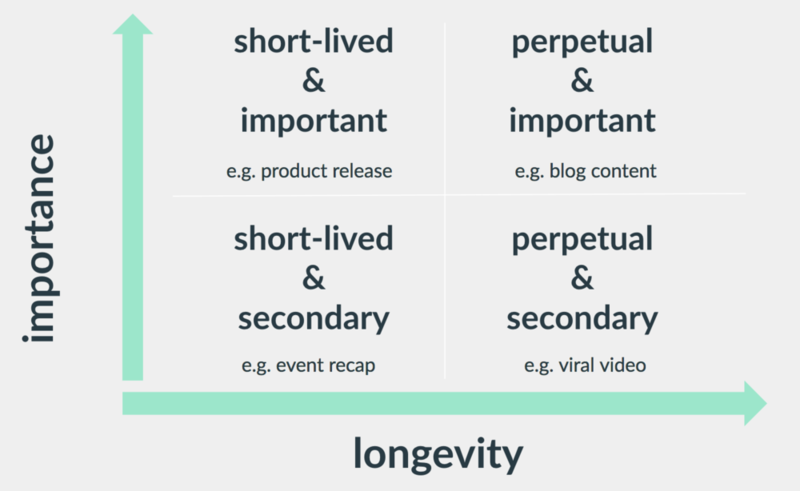 There is, however, a way to capture your audience’s attention by educating and/or entertaining them and then moving them (gently) through the customer lifecycle. 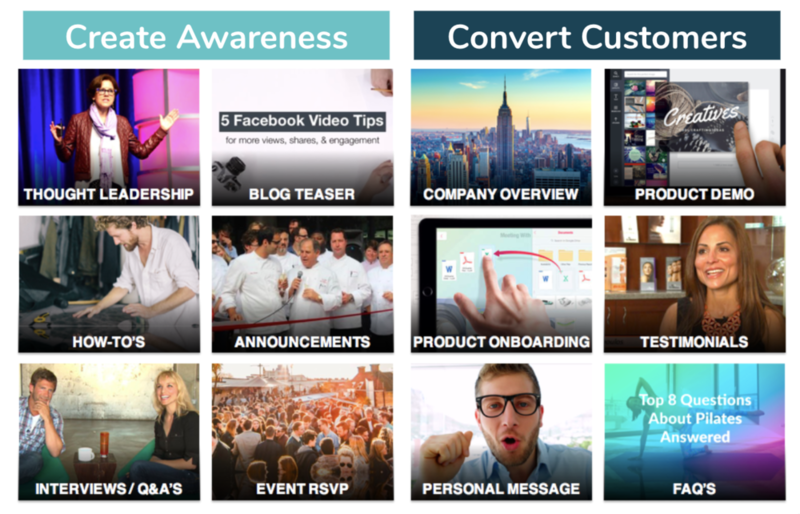 In a recent presentation I did with Animoto President and Co-founder, Jason Hsiao, we talked about this idea of creating awareness vs. converting customers. A big mistake I see brands making on social media is skipping right to the convert stage without effectively telling their brand story – I.e., the glue that makes people care. Typically (unless you have a product that is flying off the shelf) you can’t gloss over the interactions, tiny moments, and trust building in-between awareness and conversion. Start with what works (as we talked about before). Sort your most visited blog posts and/or website pages and create short video recaps that people can watch in 30 seconds - 2 minutes. Free education is an incredible way to increase video views on social media. If you’re fresh our of ideas or don’t have a ton of current content to work with, creating videos around trending industry news topics will help to drive results on social media. One of my favorite tools for finding the most popular topics right now is BuzzSumo. I simply enter the URL of my favorite industry-related websites and it shows me the most popular posts from the last 24 hours, week, month, and even year. Note: It’s also how we generate episode ideas for the Buffer Podcast (now with more than 100 episodes and 1.1M downloads). Remember when I mentioned that we do try to swing-for-the-fence once in a while with social media video? Well, inspirational videos are the perfect way to, 1) blow your audience’s mind, and 2) experiment to see what type of content your audience might like. These don’t have to be overly complicated or time-consuming either. To find inspirational topics, all you have to do is look around you. What’s trending on Twitter? What are the most successful videos on Facebook Pages to Watch? What keywords are people searching for on YouTube? My absolute favorite social media video topics (and the ones I enjoy watching myself) are in the hacks, tips, and tricks realm. These types of videos allow you to both educate and entertain your audience at the same time, which is the perfect recipe for success. For example, we were getting constant questions from our customers asking how we make customs GIFs for our website. Well, instead of writing the same answer 100 times or writing a blog post, we simply made a video. What does your audience want to know? It’s up to you to teach them, otherwise someone else will. Which leads perfectly into best practices you can use to start creating video content that performs starting today. Believe it or not, there are some scientific, data-backed ways to create better videos. I discussed mobile earlier in this article, but it’s worth a revisit here. Fun fact: More than 95% of Facebook and Instagram users access the social network from their mobile device, meaning that it’s time for us to start consider the implications of mobile and how we might evolve our social media video strategies moving forward. In a recent study we conducted with Animoto, one stat really stood out to us: Square video (1:1) takes up 78% more real estate in a person’s mobile newsfeed than does landscape video (16:9). We we looked at performance of square video vs. landscape video we found that square dramatically outperformed the latter. A simple change such as video format can increase the performance of your videos in a big way. BuzzSumo found that the optimal video length on Facebook is anywhere between 30–120 seconds. 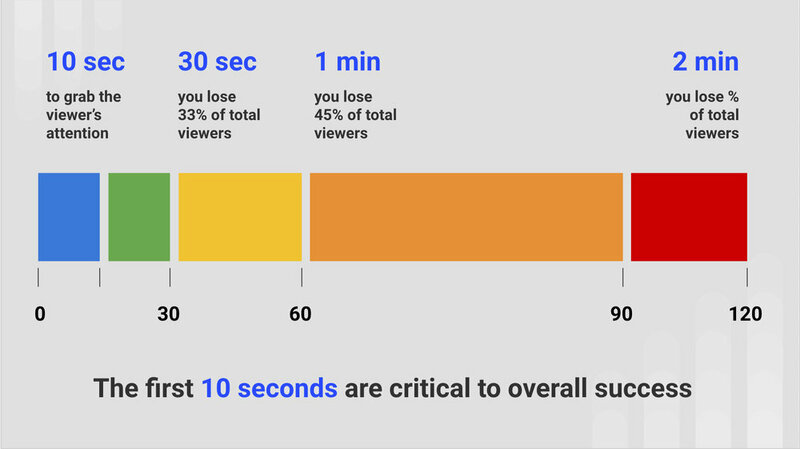 In other words, your videos should be no longer than 2 minutes and should aim to capture the user’s attention within the first 1–3 seconds. Think about your own social media habits. Are you taking your time and scrolling slowly through the feed, or are you quickly passing by each piece of content until you find something that catches your attention? If you want to perform a fun experiment, go out in public and watch people use Facebook and Instagram on their phones… it’s, well, awesome. Buffer, as you may know, is a social media management platform in the SaaS space. At first glance, you may think we’d only post content around social media marketing. That was true until we started to experiment with other topics and themes - a move that helped to skyrocket our social media video results. By creating videos focused on things like tech, education, travel, and science, we were able to tap into the topics that people truly enjoy to interact with on social media. Instagram Stories now boasts a whopping 500 million daily users worldwide. Which is why I see Instagram Stories as one of the biggest opportunities for brands and businesses in 2019. But it’s not just the sheer numbers that stick out, it’s the impact. Big brands such as Bustle, Nike, Square, and more have seen first-hand the results that Stories content has provided in terms of engagement, reach, and awareness. Blenders Eyewear, on the other hand, has generated thousands in revenue for their products using Stories ads – leveraging special announcements like a much anticipated restock, flash sale, giveaway and any limited time promos. Tap into the wealth of Facebook data to understand your audience on a deep lever (Facebook Audience Insights and Pages to Watch are gold mines). Test a LOT. Iterate and improve constantly. Remember that 20% of your videos will produce 80% of the results. Use concise messaging and assume the viewer is watching with the sound off. Are you telling your story both visually and audibly? Consumers have high expectations for right-here, right-now experiences on social media. Ensure that you are not wasting their time. Emotions are the most powerful video tool you have. Consider the mobile-first generation that we live in today. Create videos that are short, to-the-point, and in the square or vertical format. Check out this entire article video style! I recently had the pleasure of speaking at the Wistia CouchCon Conference where I discuss all of the topics above and more.